Janet (Kristin Scott Thomas) has just been appointed to a key ministerial position in the shadow cabinet – the crowning achievement of her political career. She and her husband Bill (Timothy Spall) plan to celebrate this with a few close friends. As the guests arrive at their home in London the party takes an unexpected turn when Bill suddenly makes some explosive revelations that take everyone present by surprise. Love, friendships and political convictions are soon called into question in this hilarious comedy of tragic proportions. From acclaimed British filmmaker Sally Potter and featuring a star studded cast that includes Patricia Clarkson, Bruno Ganz, Cherry Jones, Emily Mortimer, Cillian Murphy, Kristin Scott Thomas, and Timothy Spall, this witty, sharp and very funny new comedy will be a unmissable date for everyone’s diary. A sharp-edged, claustrophobic parlour piece that puts the boot into middle-class mores. Ove, an ill tempered isolated retiree who spends his days enforcing block association rules and visiting his wife’s grave, has finally given up life as an unlikely friendship develops with his boisterous new neighbours. Screen 2, The Picture House, Keighley. Cast: Eddie Redmayne, Alicia Vikander, Amber Heard, Ben Whishaw. Tom Hooper once again makes a film which I assume I won’t like and yet I’m proven wrong. 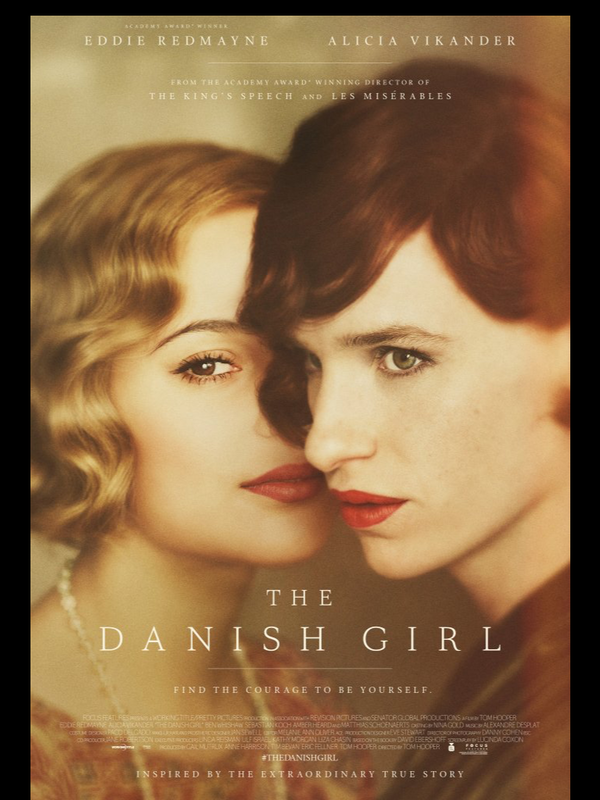 First it was The Kings Speech, now it’s Thee Danish Girl. Eddie Redmayne was fabulous in Hawking and yet terrible in Jupiter Ascending. Thankfully he is very good as Einer Wegener who is asked to help out for his wife Gerda, played by Alicia Vikander, as a model who can’t make the final sitting, in order for Gerda to complete her life painting. The feel of the stockings and dress hems and lace awakens something buried deep inside him. This gives birth to a female version of his character who, with Gerda’s help, brings Lilly to life. Soon enough though, Lilly is around more than Einer and when Gerda tries to ask for her husband back, it seems there’s little of him to show. Based on one of the earliest accounts of a transgender operation, this is an emotional roller coaster and one which will have you debating with yourself and others what the right thing to do is. I felt Einer’s plight and struggle early on but began to feel strongly for Gerda too until you just want both to have their way. Journey that I was pulled along with. Two strong actors who at times felt as though they were in a play to me rather than a movie. But there’s a weight to the choices made here as you invest in the couple. Also the movie touches on the doctors who analyse Einer and come up with some frightening conclusions. An important portrayal of a huge step in changes in society which is nowadays much much less of an issue. While it’s important to be yourself and you have that right, what cost to those around you and does your desire outweigh theirs? 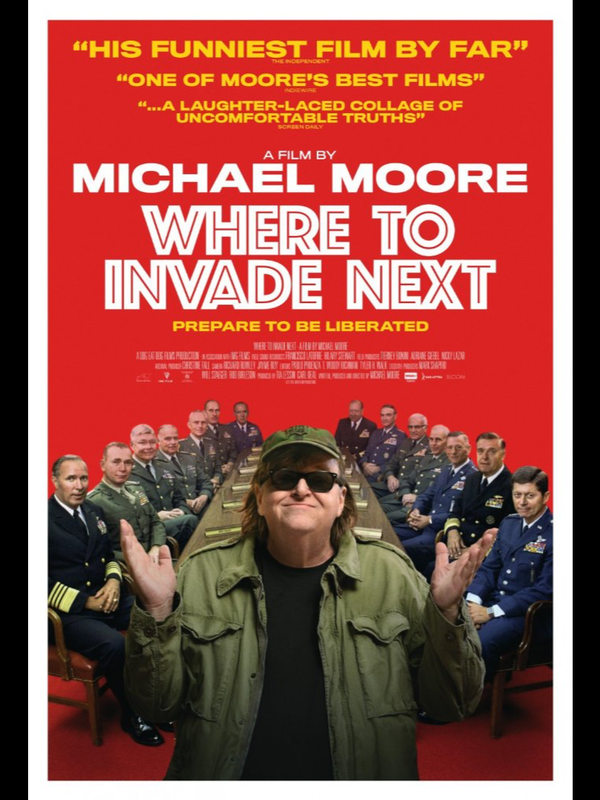 Running time: Michael Moore…..oh no, 2 hours. I became aware of Michael Moore in 2007 when BOWLING FOR COLUMBINE was getting good reviews. The man himself seemed to be this force of nature for good. But subsequent films of his painted him as a bit of a token trouble causer just trying to find another hit. He’s a professional nuisance, a fly in the ointment by trade who has become the face of the supposed hidden truths of America. But what I do like about him is that I come away from his films having learnt so much in a relatively short space of time. I knew nothing of the USA health service until SICKO for example. This latest offering of his has a somewhat misleading title. Where Moore normally has his documentary style of filmmaking put him at the feet of unfair business giants as he barks up their trouser legs, this one seems to have him grabbing at straws. He has no real flag to wave over anything in particular. But I felt that was a strength actually. The basis for this movie, rather than highlighting everything which is wrong with America, is to travel the world and showcase the things which other countries do really really well, in the hope of claiming the idea as his own and taking it home to implement there. It’s a positive feeling movie which is joyous in tone and yet still open our eyed what else is going on in the world. Again I learnt some have amazing stuff along the way in a concise and well edited two hours. There’s no through point as such but it’s still entertaining to be taught how other places run so differently. Moore, looking older and tired, seems to be enjoying this new positive exploration too and it’s got a good balance of the dark history of the states and the bright futures of the foreign lands he visits. There’s his dry delivery over the top of course, guiding you through the facts and representing them with handy animations and graphs so as not to lose you as we are dealt facts which seem too good to be actually true. This is a breezy lesson In how much of the world has its head screwed on better than we do. It’s all about priority amongst humans and not capitalism. I was surprised about how much levity there www to be had at the heads of Michael Moore and I welcome more light hearted work from him in the future.